UVSF member, Ernie Rogers, drove 3,000 miles to Alaska averaging 65 mpg! 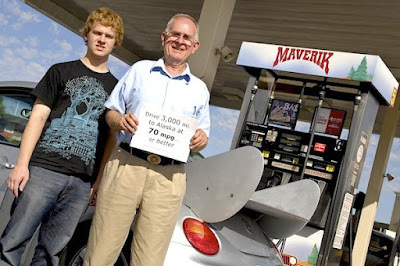 On Thursday, July 24th, UVSF member, aerospace engineer, physicist and gas mileage expert, Ernie Rogers, began his 3,000 mile driving trip with his grandson to Alaska. Ernie's goal was to reach Palmer, Alaska (north of Anchorage) on 42 gallons of fuel. That's averaging better than 70 mpg! Did he do it with is consumer model VW Beetle TDI? Ernie was confident--having won a national mileage contest two years running, getting 75 mpg each time. How did he attempt to do it? By applying the simple basic principles for saving money on gas--things that can work on any car--that he shared with our forum recently. As the sign behind Ernie suggests, he is truly a maverick, working to help the planet. Ernie's fuel saving challenge drive to Alaska is sponsored by the Utah Valley Sierra Forum. 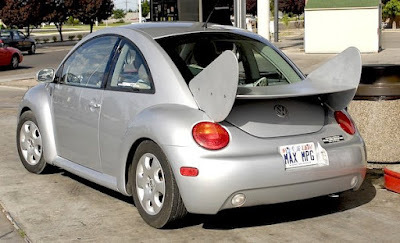 Helping Ernie achieve this incredible mileage is the drag-spoiler he designed for his Beetle. Ernie's current work is building a very efficient engine that will allow a car to get at least 100 miles per gallon, using any fuel—ethanol, biodiesel, or gasoline could be used. UPDATE: Ernie got a whopping 65 mpg overall on his trip. He's confident he could have beat his goal of 70 mpg if it had not been for unanticipated drag-increasing factors he encountered including headwinds, prolonged periods of rain and rough road, recently re-surfaced with "spray and chip."